Final Report on surveys conducted on Edges Green and Cleughfoot Farms April-October 2016. 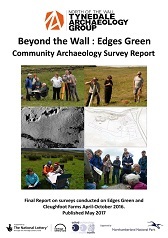 Between April and October 2016 members of Tynedale North of the Wall Archaeology Group carried out a series of landscape surveys on Edges Green and Cleughfoot farms, north of Cawfields Gap, Northumberland, as part of their ‘Beyond the Wall: Edges Green’ Project. This was funded by the Heritage Lottery Fund and Northumberland National Park. The survey area contains two separate groupings of prehistoric features. Whilst both groupings exhibit some evidence of early clearance activity, they differ in the nature of their unenclosed settlement structures and field boundary remains. The prehistoric site on Edges Green Farm contains at least two stone-founded round houses and a series of boundary features sharing a common alignment. At Ventners Hall on Cleughfoot Farm there are two sites that each contain a pair of ring-ditches, the remains of timber-built round houses. Extensive cord rig on a variety of alignments encroaches on the round houses on both sites.